Helping you know what kind of game animals are in your property, the Stealth Cam G42NG boasts all the useful features that all proper game cameras should come with. Providing you with the capability to shoot videos and record videos, this trail cam even supplements videos with audio for masterful technology that delivers genuinely useful surveillance images. The Stealth Cam G42NG provides variety with its four resolution settings. Choose from 10MP, 8MP, 4MP and 2MP to match your needs. It is able to do high definition video recording between 5 to 180 seconds so you have more than enough footage to determine the behavior of your target wild game species as well as audio to back the video up. The trail camera has timelapse function so you can confidently position the unit at a food plot and let it snap images at predetermined intervals for accurate monitoring of movement at dusk and dawn. 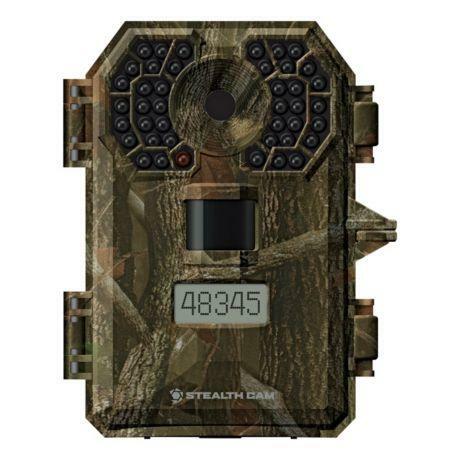 This works in conjunction with the passive infrared (PIR) override functionality that enables the trail cam to sense movement fast so it can capture the image of nearly everything that moves quickly through its frame and within its field of view. This trail camera comes with 42 black infrared emitters that ensure that night photos are bright enough for viewing. The unit also has an impressive 100-foot range to cover a wider area. The reflex trigger speed of 0.5 seconds enables it to take an extremely short time to capture a photo once a deer is seen. This ensures that you can see deer in a slew of photos that an inferior camera with slow trigger times would normally miss. The Burst Mode ensures that the trail cam will not simply take just one image when triggered, but will enable the device to take a predetermined number of images before it stops to reset. This makes it possible for the trail camera to take a series of images one after the other and up to nine images in all so you can set it up on a trail where the wild game pass, letting you know of your prey’s typical behavior. Equipped with an intuitive backlit menu programming, the trail camera lets you choose the settings easily and offers easy menu navigation. Able to capture clear images no matter what the lighting condition may be, the trail camera comes with a time lapse function that maximizes placement next to a food plot so you can learn about the behavior of your wild game through the images snapped at preset intervals. This means you can set the time the camera snaps photos at specific hours and minutes within the hour so you can come back and view a full day of activity packed into mere minutes of footage. Best for dawn and dusk movement observation, the time lapse feature lets you study your target’s feeding patterns so you can be at the site at the perfect time. Outfitted with a tough weatherproof housing, this trail camera provides you with confidence for outdoor placement so you won’t have to worry about its most sensitive internal elements getting damaged due to exposure to varying conditions in the outdoors. The manual shot capability of the unit is complemented by a Secure Lock password protection so you can enjoy truly private usage and viewing. The built-in SD Card slot provides more than adequate memory up to 32GB so you won’t have to frequently check the camera while keeping the site scent-free to prevent your target from sensing your presence. This is an easy-to-use unit on and off the trail and is quite effortless to set up and get going. Engineered with Matrix ™ Advanced Blur Reduction, Retina™ Low Light sensitivity along with a 16:9 Wide Image Ratio, this surveillance camera captures easily viewable images for monitoring of patterns and establishment of behavior so you can act and do your hunting accordingly. The GEO-TAG GPS Tagging enables use with a map so you’ll know the unit’s exact position. The Data Stamp offers more than just the time and date but also the temperature, name and moon phase so you can pinpoint the ideal hunting time that corresponds to your prey’s activity as well as which unit provides the information when you have set up several in your property. Operating on 8 double-A batteries, this trail camera features an external power jack for a 12-volt battery box for convenient and hassle-free charging. The USB output provides a flexible charging option. With a rapid recovery time out of 1 to 59 seconds, this trail camera won’t leave you with too many missed opportunities.